This isn't really a recipe, it's more of a suggestion/experiment. One which I thought went quite well, actually. A light, healthy snack for when you're craving salt, but not oil. They're cheerful, bright green, and paper thin. The crispiest melt on your tongue like tissue paper in the rain. Some remained a little more on the moist side (god, I hate that word. I don't know why. But I have to use it because that's what they were), but were still salty and tasty. Please don't expect potato chips, though. It's still spinach, after all. And it's not a bad way to put down a bag of baby spinach, either (if you're lazy and buy the bag, and why not? It's not a real recipe, so you don't need to hold yourself to any standards of hard work). I stuck with salt for most of them, but one batch got the royal treatment with a little dried basil. Turns out, spinach loves basil. And I do too. Bake in an oven preheated to 350 for around 7 minutes. Maybe a bit more, maybe a bit less. They should turn crispy and wafer thin. Carefully peel off the paper and enjoy. UPDATE: Some readers have had trouble with the spinach sticking. It's important that you use parchment paper on your baking sheets, as stated in the recipe, to avoid this. Wax paper and tin foil won't work, and obviously a bare baking sheet won't do it, either. You can find parchment paper in most good grocery stores or baking shops. wow!!! what a great idea, i have to try this soon. do you think this will work in the microwave? These sound really good, I saw a similar recipe once that used kale leaves. Andrea- What an intriguing idea. I use spinach all the time. I will have to try it. I like the name too. I could tell the kids it's like potato chips..
Andrea, what a great idea....Got to try it one of these days. love this idea, especially with the basil. Very clever Andrea! This should be the ultimate healthy chips. This is really the only sort of chip I should be eating! I'll have to try it. This is a great idea - I had these years ago at a restaurant and fell in love - Now I can make these babies at home!! I am so loving this. I think I am going to have a lot of leftover spinach this week so I will try. This would never have occured to me! But I'm 100% trying it; talk about the healthiest way to snack! Veggie Belly, I don't think this would turn out in the microwave because you really need the dry heat of the oven (think how soggy microwaving can make some things). But you can do several batches at once in the oven, so it's not too bad. Sara, kale sounds good too! Cathy, did you really? That's awesome! Indigo, as long as you're not watching your salt intake, but really, there are only so many things I can watch. What a great idea! 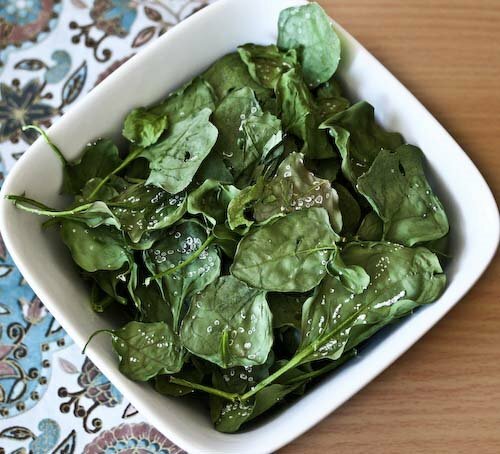 I have a bag of baby spinach in the fridge that I need to use, I may have to give this a try. What a great, healthy snack!! Keep the great recipes coming! Great idea! Perfect way to get kids to gobble spinach. Thanks. Looking great! What a great idea! Hi Mar, yes I mean Fahrenheit. I'll be more explicit about that in the future. You'd think I'd know better with a European fiance! I made these tonight along with Kale Chips and both were delicious! I used a red pepper based seasoned salt so they turned out spicy, chunchy and salty, all my favorite things! Can't wait to try this with other fresh greens. Wow! looks yummy! I am working on my diet and this recipe will really help. I want to eat more vegetables and fish and less of meat. I was wondering if you can add toasted bread in cubes with this recipe too? to put on a crunchy effect on the food.. thanks. I would like to make a bunch at once. Would this work if you put a bunch of spinach... not one single layer on the pan? Thanks for anyone's answers. I just tried this tonight! And I could not believe how great it tasted! I normally do not like spinach but these chips are amazing! Im on the HCG diet and was trying to find more ways to get my veggies in. The only issue I had is that my herbs werent actually baked into the spinach. The herbs all feel off but the taste was still there! Thanks for posting this! Thanks for the idea! I sprayed apple cider vinegar on along with the salt and pepper before baking - delicious! I saw something similar on Dr. Oz but there wasn't a recipe and I was delighted to find this. Normally, I absolutely detest dark leafy green things but I have heart disease and that simply had to change. Voila! Spinach chips! A squirt of olive oil, grind or sea salt and lemon pepper and I'm happily chewing my dark leafy green things. I also have done this with kale. Broccoli doesn't work unless you make sure ALL the stem is cut off first, or it's like chewing rocks. 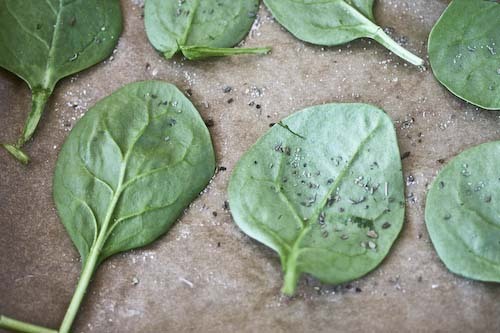 I use a dehydrator and when they are dry, with a Misto oil sprayer, I spray lightly with olive oil, and then sprinkle lemon pepper or dried tarragon or jerk spices, or even dry Ranch seasoning. 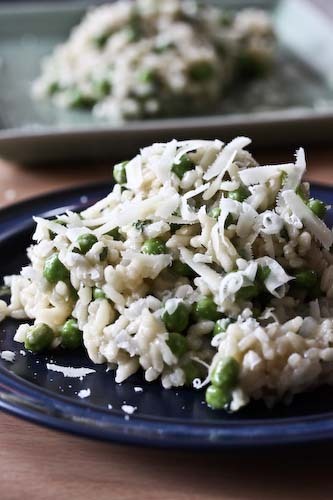 This works great with other veggies too. These are good! They taste like sunflower seeds to me. I have seen recipes similar to this but they put on cooling racks to get the air all around. I will have to try both ways.